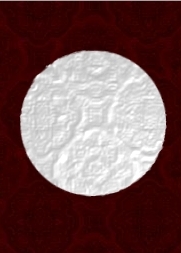 I'm working on an asset for a game mod, and I'm trying to put a custom logo on a banner texture. The banner behind the white dot/logo is a dark-red burlap texture, but I'm having issues with blending the dot into the fabric so it looks painted on or sewn into the banner. I ran through all the layer mode options and none of them do the trick - they all make the dot disappear, turn bright pink, or turn flaming bright red. I'm using Photoshop CS5, in case that matters. I assume there's some trick to this that I'm missing... maybe using the burlap pattern as a pattern overlay in blending options for the layer? 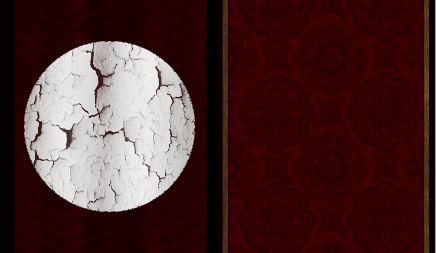 How can I realistically blend this white dot into the fabric layer behind it? 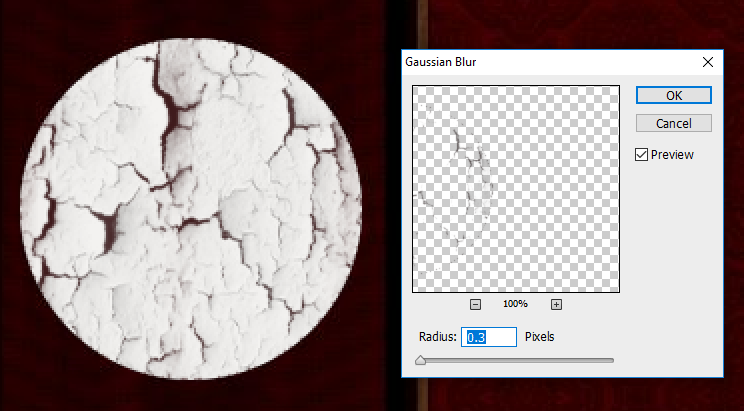 Duplicate the background layer, and drag it above the circle layer. 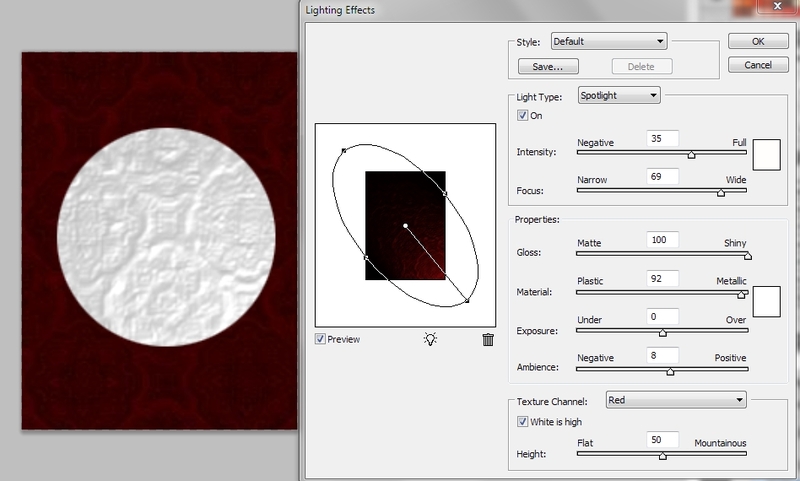 Alt+click between the two layers to clip the background layer copy to the white circle layer. 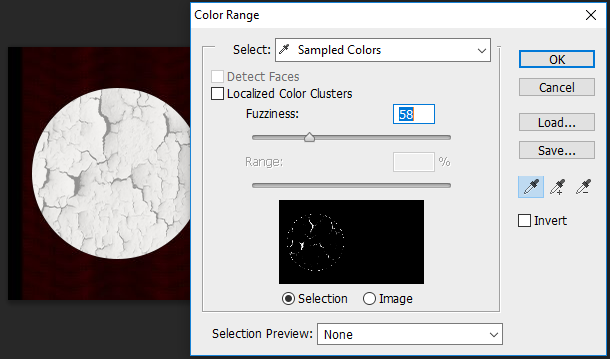 To add a bit more realism, you could also select the background copy layer and apply Filter > Render > Lighting effects, with settings shown below. This will add more of a textured/embossed feel. Then, undo the changes to the circle layer, select the circle layer, and apply Filters > Distort > Displacement, set the horizontal and vertical scale to 2, and when prompted choose the displacement.psd you already saved as the source. What I usually do is I find the shading that already exists in the background and simply brush it in onto the top layer, then add a few layers of textures to give it the painted effect. The following is a quick example of what you can do. Don't mind the jank. Find a desired texture. Desaturate it, change the levels (optional). 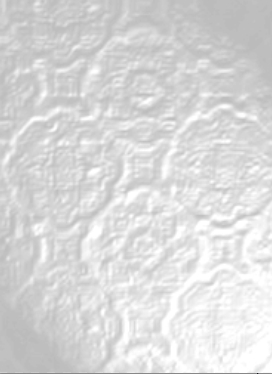 Reduce the opacity to soften the sharp texture. Create a clipping mask to the white circle. Go to Select > Color Range and click on the shades. Increase or decrease the fuzziness based on how much you want to select. Click OK. Choose what color you want fill the selection with. It's usually the best to use the Eyedropper to choose a color that would be right beneath the paint. Fill the selection with a paint bucket tool or brush it on. Then, deselect. The edges will be quite sharp and jagged so a little bit of Gaussian blur doesn't hurt. Not the answer you're looking for? Browse other questions tagged adobe-photoshop layers cs5 blending or ask your own question. How can I change colors of a B&W graphic in Photoshop?